With new job trends emerging on the industrial-scene such as gig economy, India is likely to top the global attrition rate list with the possibility of one in four individuals switching jobs, according to the survey conducted by Hay Group, a global human resource and management consultancy. It is evident that one of the biggest challenges facing recruiters next to finding the right talent is to engage and retain them. So, what misses the eye of recruiters while finding the best-fit talent? What are the possible loopholes in the traditional hiring methods that lead to a high job turnover? The job/company does not meet their expectations as formed by the job description, interview, etc. Companies often witness their new recruits going through one or more of these challenges soon after joining. Traditional screening methods lack the scale and standard required to meet today’s complex talent demand. While testing specific technical and hard skills is quite straight-forward, testing less tangible mix of skills and attributes is tougher. This is where experiential assessment comes to the rescue of recruiters for hiring across industries and varied job profiles. 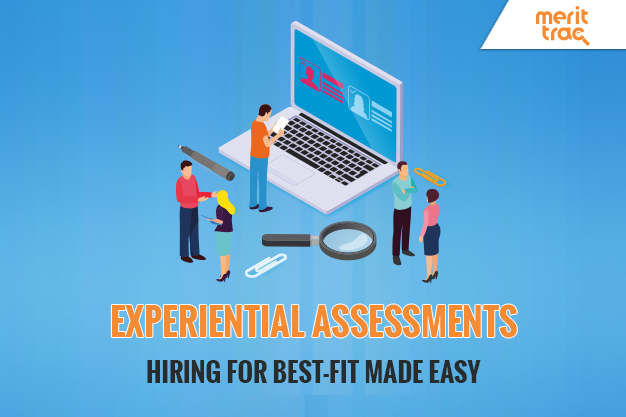 From experiential interviews to other assessment tools such as experiential assessments using Authess, equip hiring managers to measure competency for diverse roles. Here are three prominent ways in which experiential assessment make hiring more effective. Traditional job interviews are often blamed for a biased evaluation. Personal biases often cloud the objectivity required to evaluate a candidate’s job and company culture fitment. Experiential assessments comprise of problem-based automated tests that can adapt to real-time interactions and analyze user patterns and decisions against reference data to categorize candidates ranging from novice to expert. This brings higher authenticity and accuracy into the hiring process. Job auditions or pre-employment try outs are one of the most popular experiential hiring processes. The LinkedIn Talent Solutions 2018 Global Recruiting Trends survey has recognized job auditions as one of the most effective recruitment tools for checking interviewer bias. Personal interviews leave room for vagueness and misinterpretation as they rely on short answers to standard questions. Experiential assessments enable recruiters to assess job applicants on the basis of not just what they tell but show in terms of skills. The evidence of skills in this case is real-time, in-depth and quantifiable. Employability skills such as problem solving, critical thinking, communication, learning ability, etc. are extremely crucial to the new-age liquid job profiles, and yet, are difficult to measure accurately. Experiential assessments use adaptive and automated test formats at scale to track inputs from direct or indirect sources. Credo Education, a Boston-based company partnered with Authess to create an assessment program to evaluate foundational skills of interns over a course of eight weeks. The idea was to bridge the skill gap between the institutes and the industry through a real-time model which not only measures the current skill level of the interns, but also evaluates their progress in those areas. Credo, with the help of authentic assessments, was able to develop quantifiable reports on each intern’s performance which were highly useful for the employers in deciding which interns to hire permanently. Experiential assessment is as much a tool for more accurate candidate assessment as it is for providing a better candidate experience, which further contributes to strengthening the employer brand. In absence of a standard benchmark of the level of interaction for interviews, candidates often complain of the lack of communication from hiring managers. Intuit, a software firm, revamped their traditional hiring process after receiving similar complains on numerous occasions. The firm developed a more dynamic, experience-based process which could assess candidates on the basis of both technical and soft skills. On completing two years of application, experiential hiring showed improved results in terms of both quality and speed of hires. The process also had added benefits of improving engagement of the hiring managers as well as enhancing the experience of potential employees. In an industrial epoch when data is clearly driving recruitment decisions of organizations, authentic assessments are emerging as the need of the hour. Global industry leaders that are also considered to be the most successful employers such as Apple, Google, Amazon and Microsoft rely heavily on such scientific recruitment models. Clearly, experiential assessments are the solution for organizations seeking the dual advantage of hiring top-rated talent in the industry while making them stick.